If you’ve ever found yourself searching the web for customer support, then you’ve probably encountered a WordPress Knowledgebase. A knowledgebase is simply a carefully-organized collection of articles or media designed to support customers when they have a complex question they need answering. While there are firms out there that specialize in creating knowledge-base software, it can be incredibly easy to add your own WordPress knowledgebase gallery to your site too. Knowledgebases don’t have to be limited to providing customer support. In fact, companies can use them to create almost any form of educational resource they choose. Knowledgebases can help to set companies apart from their competitors, too. They give them a chance to show off their skills and establish themselves as an authority in their space. While some companies use a collection of blog posts or articles to help support their clients, professional photographers often make the most of their knowledgebases to help them show off their skills. After all, what better way to demonstrate what you can do than to combine your photography expertise and images into slideshows and guides for your customers? Make your followers happy: While it might not be possible to provide immediate answers to every customer who reaches out to you through email, your WordPress knowledgebase can help answer the questions your customers have about your services. This means that you end up with more conversions and fewer confused clients. Great for SEO: Today’s photographers need to think carefully about how they can manage their online presence. A website optimized for SEO purposes can help you rank for the right terms and phrases so that you appear more often in front of your target audience. Ideal for thought leadership: Want to convince your audience that you’re the perfect photographer for their special event or wedding? A knowledgebase can help you to do just that, by demonstrating your skills in a highly professional way. So, how do you create a WordPress Knowledgebase gallery? There are two primary solutions available to photographers who want to create their own WordPress knowledgebases. The first option is to use a plugin, while the second involves using state-of-the-art knowledgebase themes. There’s no one-size-fits-all solution for all situations. Using a knowledgebase plugin can be ideal for some people because the tool simply integrates into your existing WordPress experience. However, because the plugin isn’t specifically designed to work with your theme, you might need to add some custom styling to the mix to ensure that your galleries look great. On the other hand, knowledgebase themes ensure that you give your customers a great experience right off the bat. In this article, we’re going to explore how you can use a professional photography theme to transform your website with knowledgebase galleries. Since your photography theme will be the tool you use to create your WordPress knowledgebase gallery, it makes sense that you’ll need to spend some time finding the right solution. There are plenty of knowledgebase-ready themes out there, including our very own Envira Gallery. Fresh, clean, and sophisticated, Envira allows you to create stunning photo and video galleries in a matter of minutes. You can then combine these galleries with text to create slide-show style knowledgebases. 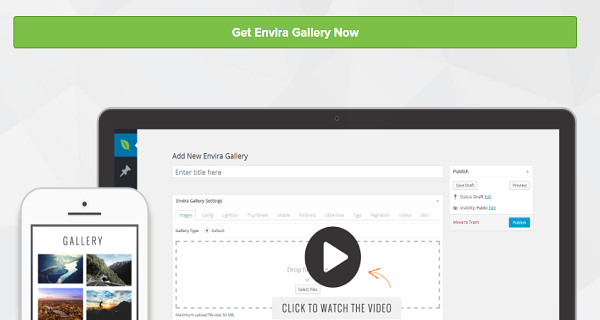 To start your WordPress knowledgebase experience, all you need to do is download Envira Gallery. This theme/plugin allows you to drag and drop stunning video and photo galleries into existence within minutes, with mobile-friendly responsivity built-in. You can click on the “Add New” to immediately create a new WordPress knowledgebase gallery. Or, you can click on “Envira Gallery” at the top to check out any of the pre-existing slideshows you have in place. When you click on the “Add New” button within Envira Gallery, a page will pop up with the title “Create a New Gallery.” Here, you can choose what kind of slideshow you want to create for your knowledgebase. There are a range of different options to choose from, including those specifically designed for Instagram, if you’re the kind of company that likes to make the most of their social media presence. Clicking on “Default Settings” will allow you to create a basic knowledgebase. Don’t worry, as soon as you get to the editing page, you’ll be able to change different aspects of your design to make sure that it makes the right impression on your audience. Once you’ve chosen your template, you’ll be taken to the “Add New Envira Gallery” user interface. This looks very similar to the standard WordPress post page. The only difference is that instead of adding text to a blog or article, you can drag and drop files from your computer, or other sources. For each file you add to your knowledgebase, you’ll be able to edit the various details around that content. For instance, you can change the title of the image for SEO purposes and add a small caption of text. In the caption box, you can add the tips or guidance you want to give to your customers. This transforms your gallery into more than just a selection of pictures – it becomes a slideshow of useful information. After you’ve finished editing the tags and information on each of the pictures you’ll be loading into your WordPress knowledgebase gallery, you’ll be able to use the Envira Gallery settings to change the formatting of your gallery. For instance, you can enable the Slideshow lightbox setting, which transforms your pictures and content into an educational experience for your customers. Once you click on the “Enable Gallery Slideshow” box, you’ll be able to choose whether you want the slideshow to play automatically or not, and how fast the pages should change. You can also check a box that pauses the slideshow when someone hovers their mouse over the content or image. With Envira and similar knowledgebase themes, you can provide your customers with a next-level experience through your photo portfolios. By transforming your galleries into knowledgebases, you can show your industry authority, boost your SEO rankings, and help your customers learn more about what you have to offer. Why not try implementing a knowledgebase for yourself? We’d love to hear more about your knowledgebase creations. Feel free to share your experiences below and follow us on Twitter or Facebook for more handy WordPress guides. Great, this can be an additional value using wordpress as knowledge base. I feel there are many gaps which i can see in the wordpress themes like automation, tracking changes, commenting and integrations. I preferred using plugin than a theme for my Knowledgebase. I have been using Helpie Knowledgebase for my Gallery website and I have to say it has very well reduced my support to a great extent. Would it straight out be possible for me to utilize Envira Gallery for a knowledge base based on YouTube video answers (my own stuff that I would appreciate present in a knowledge base form)?